Abandoned temple in the village of Starinki. 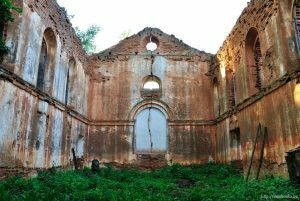 The Church of Saints Peter and Paul in the Old Towns was built in the 1830s on the outskirts of the village on the orders of Alexander Lensky, who at that time owned this place. Originally, the building was erected under the church and was a rectangular temple in the style of late classicism. However, a few years later the church was handed over to the Uniate Church. And at the very end of the 1830s there was already an Orthodox church here. 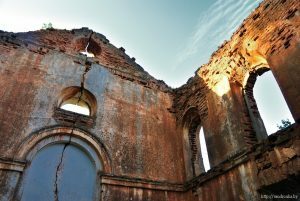 This abandoned church in Starinki was destroyed during the Great Patriotic War. It was not reconstructed. At the moment the temple is in a dilapidated state.